At Keuka Studios, we custom design staircases based on your taste and needs. For clients who want an open, airy, or minimalist feel for their home or business, we recommend staircases with open risers. Also known as floating stairs, staircases with open treads allow light to pass through. Natural lighting, in combination with the weightless look of floating steps, creates an atmosphere of ease and elegance. Floating staircases come in all shapes and styles. For a personalized, modern look, our team will work with you directly to design the perfect floating staircase. First, you’ll have to decide on the support structure you want for your stairs. Whether you prefer cantilevered stairs or want the support of a stringer, we’ll create a staircase that is sturdy but sleek. Truly cantilevered stairs are only fixed on one side; the treads usually attach to a fixture built into a wall. On the opposite side, no structural support connects the steps to one another. However, because of building codes in the U.S., a handrail must run along the unfixed side of the treads. Another popular floating stair style is the mono-stringer staircase. Instead of having fixation on one end of the treads, the support comes from a stringer running down the middle on the underside of each step. Keuka Studios designs and produces double-stringer stairs with open treads and floating spiral staircases. We designed this unique grand entry floating staircase for a client in Candlewood Lake, CT. This staircase includes curved steel posts powder-coated in “raven black,” Keuka Style cable railing, oak wood-top rail, and thick treads. This modern mono-stringer glass railing staircase has steel posts powder-coated to look like copper. It features open-riser wood treads and our Ithaca Style cable railing. 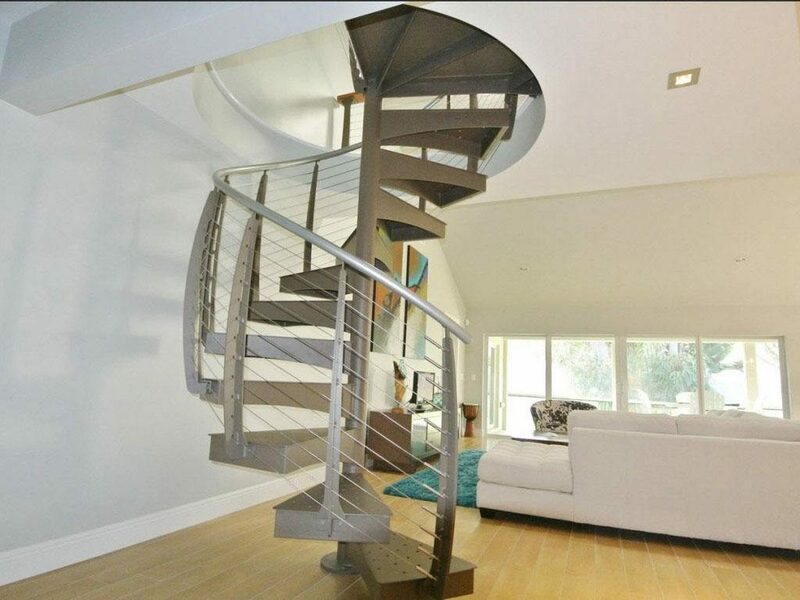 This custom-made staircase features steel posts powder-coated in “dazzling pewter,” curved Keuka Style cable railing. 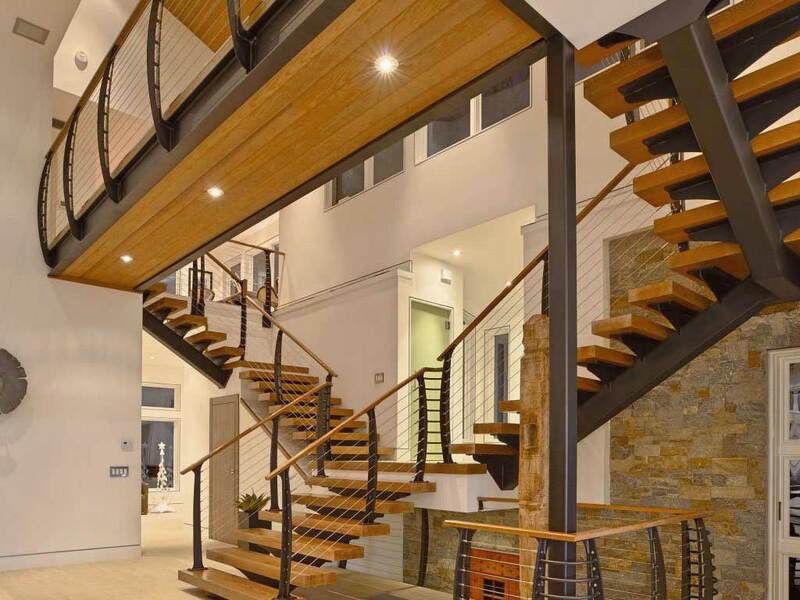 For this mountaintop home we designed Ithaca Style cable railing for a side-mounted double-stringer staircase. For the cables and fittings we used black stainless steel. The open-riser stair design allows for natural light to pass through the house. For our client in Westchester County, we custom designed a floating double-stringer staircase. The steel has a “raven black” powder-coated finish and the Ithaca Style cable railing is topped with a Brazilian Cherry rail. As seen in this Keuka Studios rendering, cantilevered staircases don’t include a support stringer underneath the treads. Rather, each step is attached on one side to a fixture within the wall. Interested in floating stairs? Contact us.